Not even Rudolph's nose can compare to the striking red paint on the all-new RC Coupe. A more dynamic red exterior paint color is made brighter and with more contrast due to an entirely new painting process, using a two-color base of both silver and red. The luminous red paint is achieved through a meticulous paint process using four base coats of paint which are then baked twice. Layers of colored and clear coating are used to control some of the color's reflections and establish a balance between the brightness and depth - two elements that traditionally work against each other. As a result, light hitting the paint reflects off the red layer and also off the silver layer below, which adds depth and a metallic highlight to the red coloration. Prior to this new, two-color base process, the factory used base coats with the same color tone (red and red). 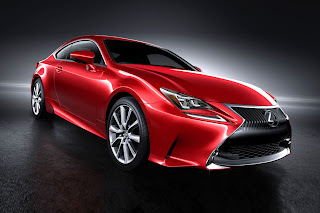 The all-new RC Coupe was unveiled at the 2013 Tokyo Motor Show and will be on display at the Lexus space at the 2014 North American International Auto Show in Detroit.